The CoffeeShop Blog: CoffeeShop StarStruck Photoshop/PSE Action! Today I am posting a new action, CoffeeShop StarStruck. I used a beautiful image from Amy Mize Photography in the "ad" above. This action gives a bright subtle pink enhancement to your image. Like most actions it won't work on all images, but can be a beautiful enhancement. Run the action on an image color/contrast adjusted and then adjust the layers to taste. I hope you enjoy this new action! 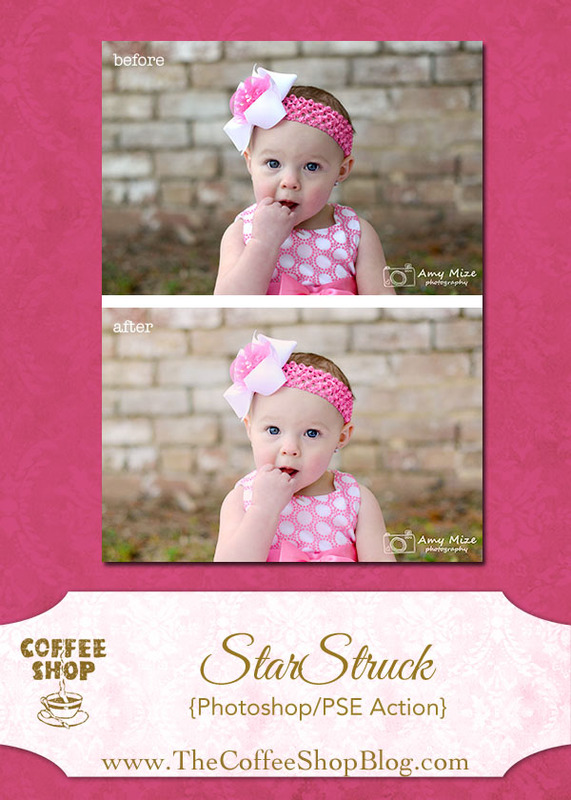 Download the free CoffeeShop StarStruck action. You can also download it here. Thank you so much you always have such wonderful freebies!! Thanks! Can't wait to use it. I'm liking this action. . . thanks for sharing it with us! new favorite action! being a novice photographer and really only taking pictures of my girls or my blog your actions really make a difference! thank you!! Thank you very much for this beautiful action. I love the soft effect. Thank you also for sharing all your actions so generously. Thank you so much! This action is really great!